My mom has a Colorado scenic calender that hangs near the kitchen. This month’s picture is titled, “Little Snake River sunrise.” The sun shines on the dry mountain peaks giving them a tan color for the horizon. The trees shimmer with orange and yellow. The sky is blue. You can see the fleeting trace of dark clouds at the top of the picture which are being replaced by puffy white ones that lay low in the sky by the peaks. And there is a double rainbow. I notice that I tend to stare more at pictures or paintings these days. I soak in the color schemes or theme. I try to visualize what the artist had in mind. This picture was the same. Just one of those that makes you wonder if the photographer purposely waited until sunrise to take the picture or whether it was spontaneous. I go with the latter. Like the picture above. It was taken last Autumn, a day after one of my chemo treatments. 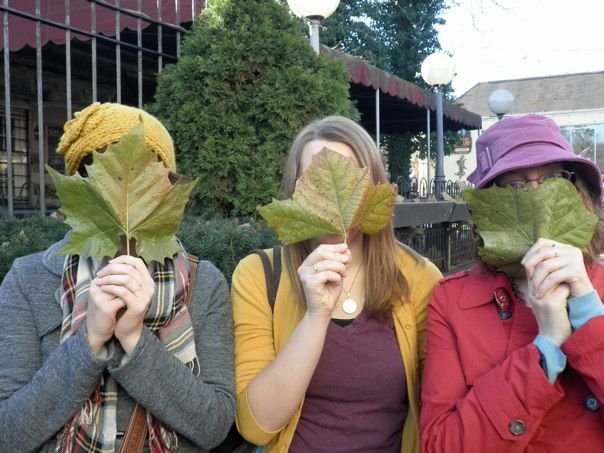 My sister and two college friends were going to Yellow Springs to enjoy the air, colors and tourism. They really wanted me to go. So I went. I had a great time. This picture was spontaneous. Look at how perfect it is. Everything from color coordinating, our hand positions (that was not planned either) to my eyes peeking out from the leaf. 🙂 I thought the other two were doing the same. I don’t think the picture would have turned out as great if we planned it. And I love to plan! Ask my family…it drives them nuts. There is nothing wrong with planning ahead. Ask event coordinators. I am sure the word procrastination is never mentioned during their interviews. It is actually a job I could see myself thriving in, minus the telephone calls. Aside from profession, when you plan ahead based on circumstances, it is harder to embrace change. Trust me, it seems to be my life’s bad habit. I wrote a post at the beginning of Spring about how my vision is blurry when I take my eyes off Jesus. Two seasons later I see parallelism to my future much like a leaf. A leaf grows in the Spring. It nourishes in the summer, and it dies in the Fall. Its beauty peaks a few days before it sees the ground. Have you ever watched a leaf fall from the tree to the ground? How is a leaf to know the timing of when it will be set free or the circumstances around it that will shape the direction of its fall? Not that I am falling (well, ok, I do physically when I twist my ankle), but the circumstances around me seem to be falling. At least in my leaf-like eyes. Circumstances such as my last day of work is in exactly two weeks with no prospects open for something new. Circumstances such as my next MRI is October 22nd. To be honest, thoughts cross my mind frequently of what those results will show and whether or not I will have to restart another treatment. Circumstances such as finding an apartment, fixing my car, putting my paintings in coffee shops, or where God needs me to serve in a ministry. Circumstances–temporary things that shift like the wind. Circumstances that weigh heavy on the heart, much like the tug of gravity on a leaf. Circumstances that are out of my control or leave me confused. I cannot see what lies ahead, but I have to trust in God’s timing. It is perfect. It is not spontaneous like human plans. It is tenderly planned to meet all my needs. He sees the greater picture. I see the spontaneous moments piece by peace. I must admit that as much as I try to keep my eyes on Jesus, I am more like Peter who looked down at the roaring waves beneath his feet. Life is walking by faith. “Now faith is the substance of things hoped for, the evidence of things not seen,” Hebrews 11:1. And faith is much like Autumn. Change is here. Change is not always a strand of negative effects. Without the change of colors and falling leaves, how will Winter ever arrive? I must embrace change. I must embrace the Autumn in my life, for even when everything around me seems to be falling–it is beautiful. And so I wait. I wait for God’s timing, because if a leaf falls too soon it can be trampled. If it falls too late, it can wither. I wait for His release of beauty as I enter the Autumn winds. Rich Mullins. “Hold Me Jesus.” A Liturgy, a Legacy, & a Ragamuffin Band. (1993). Your picturesque words brought tears to my eyes…Thank you for sharing your heart in this autumn season of your life. You’ve braved the ever-changing winds and ravaging effects of your NF2 disease for ten years this November 2012. You’ve taught me so many precious things about life, love and laughter. You are my earthly heroine. I love you, as always and forever, my child.